I also worked with acid on this stone, and made a film from the pictures of the different work phases. For each photo I put the circular stone back into a tray planted with grass in a way that the base of the stone was on the same level as the soil (the stone had to be raised a little each time after the application of acid). 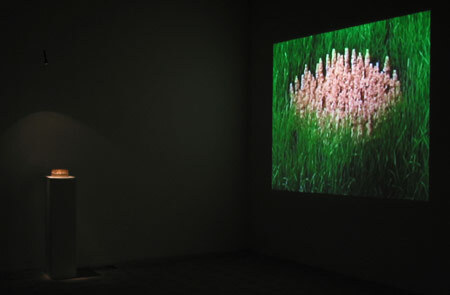 The rhythm of the work was determined by the speed at which the grass grew, and thus on the film the grass appears to develop at the same speed as the "stone grass".